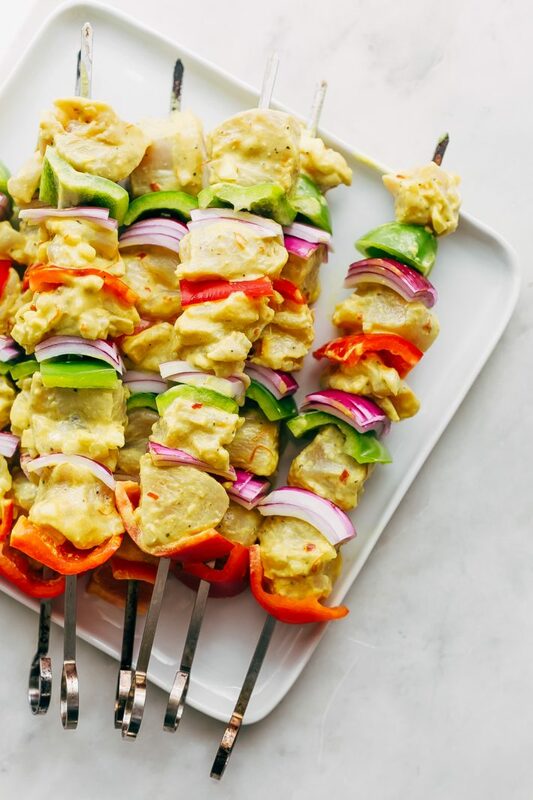 Marinated jujeh chicken that’s been threaded onto skewers with peppers and onions that can easily be tossed on the grill all summer long. 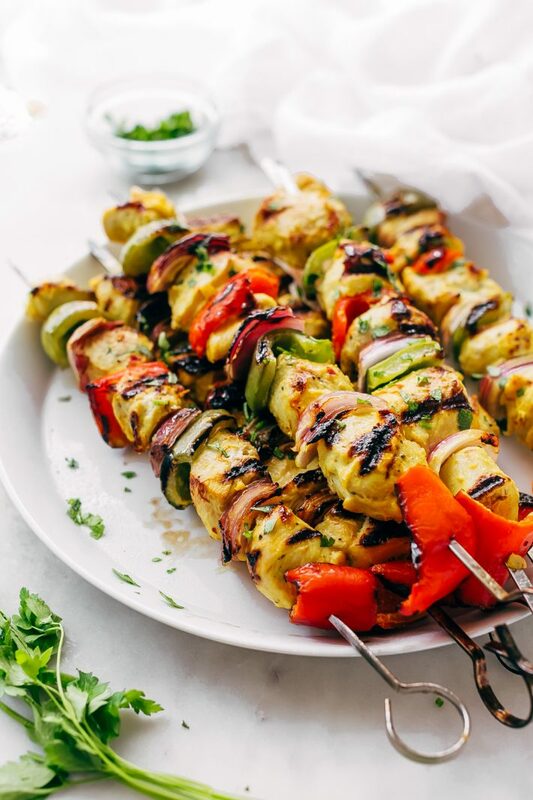 These Persian chicken kebabs are sure to become a family favorite! Throw another skewer on the barbie! Or is it a shish kebab, kebab or kabob? That’s a lot of names for something that’s essentially just chicken on a stick. It’s officially summer! And that means two things for sure: 1.) the weather is going to be unbearable here in just a second 2.) there will most likely be grilling involved for dinner. 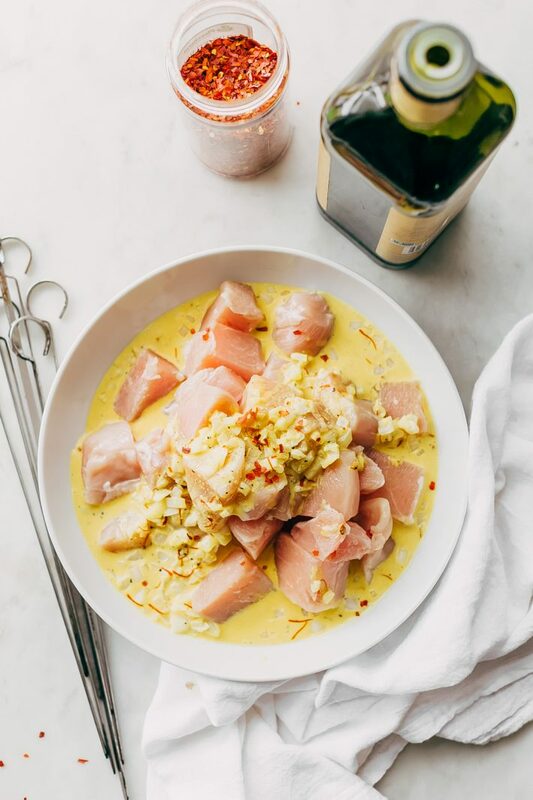 One of my favorite things to do during the summer is getting into the kitchen nice and early in the morning when the sun isn’t yet beating down from the kitchen window and marinate chicken with a few pantry staples and let it all just hang out in the refrigerator until dinner time. This means I don’t have to be in the kitchen prepping and cooking during the hottest part of the day, and it also allows for the chicken to have enough time to soak up the flavors and tenderize! On any given night you’ll find meat//poultry//veggies being thrown on the grill and this summer will be no exception. 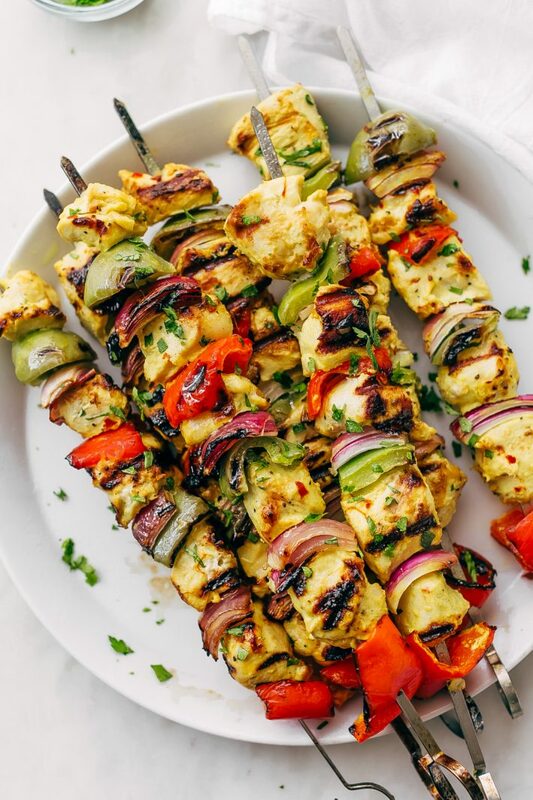 One thing I make every summer (at least a couple of times, if not more) are my moms Persian chicken kebabs. She started making these around the time that I was in my final year of college, and they became an instant family favorite. If you’ve ever ordered jujeh chicken (or joojeh kebab) from your favorite Persian restaurant, these chicken skewers taste just like that. We like to add in a few peppers and onions for a little color and more flavor. Naturally, she shared the recipe with me and when I heard how simple it was, I couldn’t believe it! Jujeh chicken is one of my favorite things to order at a restaurant and never did I think I’d be able to make it at home and have it taste so good. Dare I say it’s almost better that any restuarant? 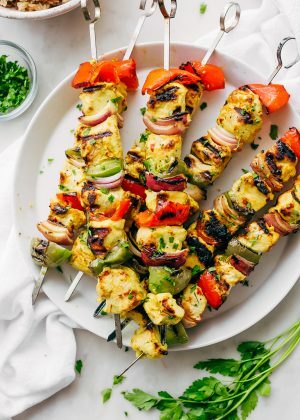 After making it for years and years myself and tweaking things here and there, it’s morphed into these super grilled chicken skewers that no one can get enough of. I’ve shared these at barbecue parties during the summer with friends and family, and they’re always a hit! The best part: they require just a handful of straightforward ingredients that most of us would consider pantry staples except for one ingredient which I would say is optional. More on that in a bit. 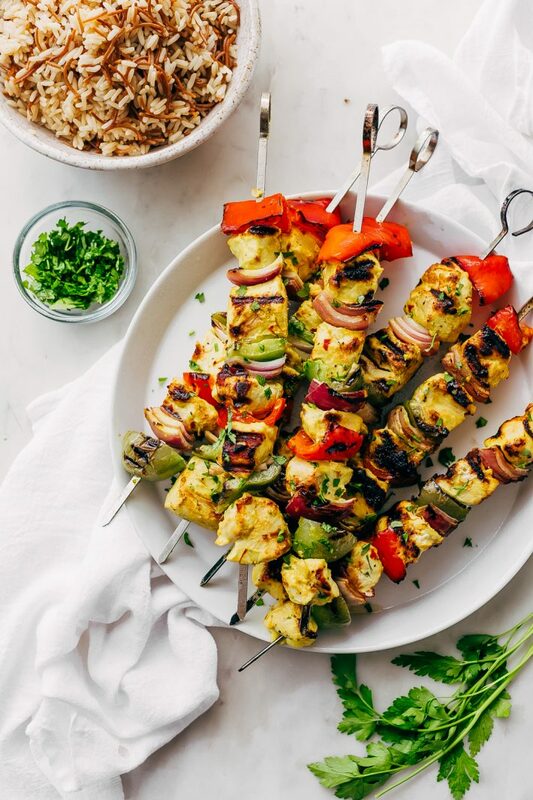 Persian chicken skewers are something I love making for get-togethers because there’s just something about chicken and veggies on a stick that makes people so happy! If you serve the same thing on a plate, it’s just not as appealing as it is on a skewer? Let’s start with the marinade. We’re clearly using chicken here. I prefer these with boneless skinless chunks of chicken breast, but you could also make this with chicken thighs if that’s more your thing. To make sure these chicken kebabs skewers are flavorful through and through, I suggest marinating for at least 6 hours and up to 24 hours. I usually go and recommend going the 24-hour route because all it requires is about 15 minutes of prep work on your part. What you’re left with are the most tender and flavorful chicken kebabs you’ve ever had. I’d say that’s worth the 15 minutes, wouldn’t you? Mayonnaise: the key ingredient – I’d never make jujeh chicken without it! This is what makes these kebabs OUTSTANDING. The mayonnaise helps tenderize these chicken pieces while adding a rich and almost creamy, flavor. Something yogurt would fall short on here. Chopped yellow onions: other than adding flavor, the onions break down when you combine them with lemon juice and salt and help tenderize the chicken further. Grated garlic: no justification needed. Spices: Just a couple of things here. You’ll need ground turmeric and red pepper flakes. That’s it! One other ingredient I use is saffron. However, I’ve listed it as optional here because not everyone keeps saffron on hand! It does add a unique flavor to this, but you certainly don’t have to run out and get some. Can you marinade the veggies too? Of course! I suggest removing the chicken from the refrigerator for an hour before you’re going to grill them. You can cut the peppers and onions and add them to the marinade for that hour. I don’t suggest marinating the veggies overnight because the acids in the marinade would break them down too much. These  (affiliate link) are the metal skewers I own. You can also use wooden bamboo skewers for this as well. If you decide to go the wooden skewer route, I suggest soaking them in water for as long as you allow the chicken to marinade. This keeps them from burning on the grill. Leftovers will hold up well for up to 3 days, and I usually like to box them up for meal prep with a small portion of rice in these containers  (affiliate link). This makes for easy grab-and-go lunches during the week! 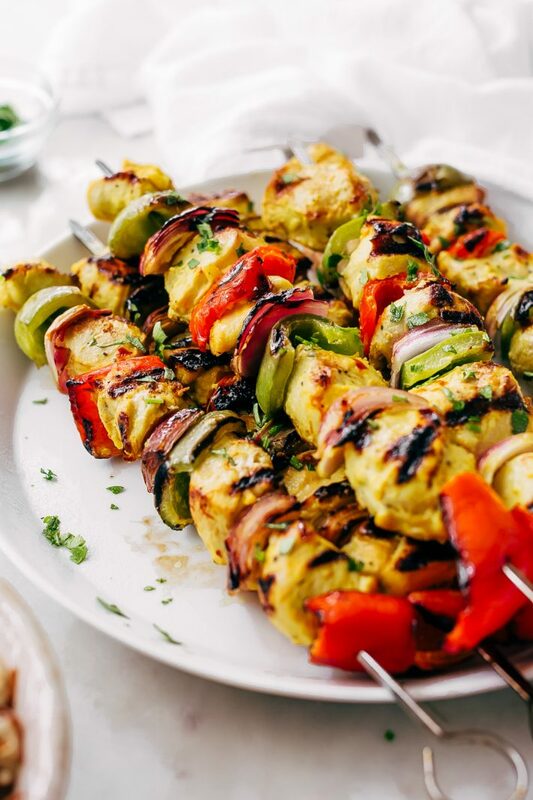 I suggest giving these Persian chicken kebabs a go if you’re planning your 4th of July menu. It’s something new to try, and it’s one recipe that’s almost always on ours! MARINATE: add the saffron to a small bowl along with 1 tablespoon of hot water and let it steep, covered for 5-7 minutes or until the water turns a bright yellow (if using). In a large bowl, combine the saffron water and all the marinade ingredients except the chicken. Add the chicken and stir to coat evenly. At this point, you can pop everything into a zip-top bag (for marinating) or just leave in the same bowl. Add the chicken and toss to combine. Cover the bowl or zip the bag and allow the chicken to marinate for at least 6 hours or up to 24 hours in the refrigerator. PREP: Remove the chicken from the refrigerator about 1 hour before cooking. Add the cubed veggies to the chicken, toss to combine and let marinate. Thread the chicken on to the skewers alternating with the red onions, green and red bell peppers. Repeat until you’ve used up all the chicken and veggies and discard any leftover marinade. When ready to grill, prepare the grill by lightly oiling the grates with any high heat oil or just spray with cooking spray and let it preheat on medium-high. GRILL: Grill the kebabs until they cook all the way through. You can test to see if the chicken is done by slicing through a piece with a knife, it should take roughly 8-12 minutes total. Serve warm over buttered saffron rice, vermicelli rice, or with flatbread and a salad. Though the chicken will be ready to use in 6 hours, I highly recommend marinating the chicken a day in advance, the flavors are so so so much more intense that way!